How did you go from being a lawyer in Athens to being a children’s clothes designer in London? It is a funny one, isn’t it! I studied law in Athens, and that was going to be my life: being a lawyer in Athens. Living in the UK was never part of the plan—but then I wanted to combine my law degree with a qualification in history of art, so I came here to study at Sotheby’s for a year. I met my husband, and that was that. After qualifying as a lawyer in Greece, I moved here and had children. Then it was difficult: I wanted to do something with the law—I had put so much effort into my degree—but to practice here was tricky. Instead, I thought I’d do something creative, out of the box, and my friends said, “You should do something in fashion.” I had an individual style, I suppose. It wasn’t typical of what mothers wore at the time. 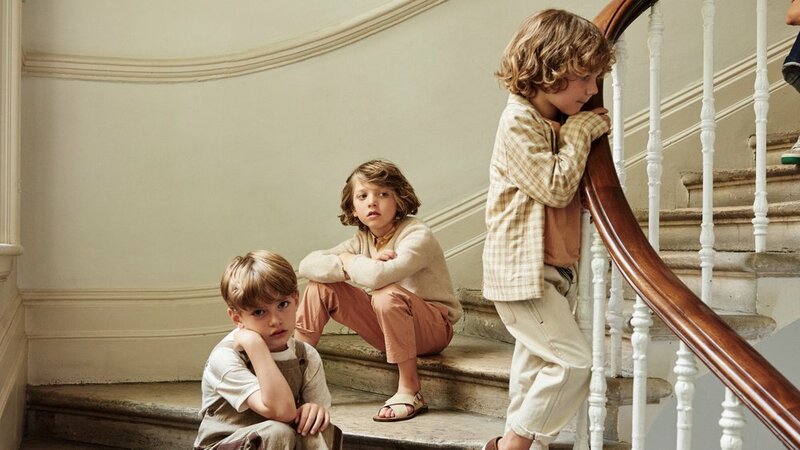 I’d always loved children’s clothes, and at that time I felt no one was seeing childrenswear with a fresh eye. It was very much either Gap jeans and hoodies, or the same sort of clothes we’d been dressing kids in for the last century. Go to a kids’ party and you’d see a dozen smock dresses. There was no thought to design. When I started in 1999, womenswear was so fashion-forward, but childrenswear just hadn’t progressed in the same way. So, I put together an edit of all the things I liked from designers who didn’t make childrenswear, and asked them to create a smaller version. I did my own edit really. And at a time when people were really starting to include their children more in their lives, to spend money on them, my approach to dressing them really chimed. Surely, though, you are more limited in terms of materials and colours? Of course, you are more limited with your choice of fabrics. Practicality is important—you want to be able to wash kids’ clothes more regularly, and you want them to be comfortable and cosy. When it comes to colour, however, I don’t know why we’d see one colour as more child-friendly than another. Why did we ever think pink should be for girls and blue for boys? Why did the Victorians decide kids should wear white—and why do we now dress them in primary colours? Children these days are brought up with a far more sophisticated colour palette. I never think about colour in terms of what is popular. I think about what’s pleasing to my eye. The Caramel style is pretty distinctive. How did you develop it? I started with the idea of looking towards what is local, what is British, what we have here that we can utilise. I found factories in Scotland, for example, that produced Harris tweed, Fair Isle and cashmere. I researched old English school uniforms, and thought about how we could make them less ‘vintage’ and more relevant and contemporary. People say the Caramel style is quite vintage—but it’s modern vintage. It’s taking the past and making it relevant. So how did you end up branching out into womenswear? I wanted a challenge. I had done kids’ clothes for 18 years. I know it’s not the norm: people don’t usually transfer from children’s to womenswear, but I don’t really care. I don’t think about whether I am a British designer, a European designer, a Greek designer, a kidswear designer, a ladieswear designer, or whatever. I don’t care what I’m doing so long as I’m doing it for the love of it—and I think people find that refreshing. It is far too boring to be in the mainstream. You have to have the maturity and strength of mind to say, “I am going to go with what I believe in.” I ask myself who it is I am dressing—myself, my daughter, my mum, my friend—and I let it go however it evolves. Isn’t it daunting, entering a market that is so saturated already? Of course! All the time. It takes a huge amount of time and energy out of me. Sometimes I question why I am doing all this. If I thought I was just doing this for the sake of it, adding to all the crap in the world, I wouldn’t have done it. But I feel there was, and still is, a gap in the market. Parents of my daughter’s age aren’t going to spend all that money on those mega-brands—that type of fashion is waning—and the appetite for dressing yourself and your kid in reasonably priced clothes in amazing fabrics is growing. Is there not a fear, doing a mother and child collection, of creating a collection of little adults? That’s not my thing. My customers aren’t those customers. They’re not interested in creating a mini-me—and besides, I don’t think it even works. You have very different body shapes, different faces—it looks weird physically, and psychologically it is a bit bizarre, I think. Of course, you want to influence your kids for the better—but it’s also important to give them the freedom to become who they want. I am not going to say that I am that person who travels the world and is inspired by India, because it is not true. I just have this need for colour. I always start with a colour, and then I work with an amazing team of people to develop my own style of print. Print-making is another major tradition in this country. Every season I create a mood board for a pattern, and try to challenge conventional colour combinations: why not green with this pale blue, for example? I like to put colours together which you wouldn’t normally marry. In addition, I spend a lot of time in London and New York at the various markets and vintage fairs. I really enjoy finding a garment that has something charming about it, something I love and understand despite the old references. To see the colours, pattern and fit of something like that transformed to make it ‘now’—to give it new life and attitude—that excites me. It’s almost a mathematical exercise. My team are fitting constantly on children to make sure they are popular, and of course that they fit. How much of this trial modelling were your own kids forced into when they were younger? I have photos of my son wearing skirts and bikinis, because I was trying to decide what they would look like on an 18-month-old! Now they can’t bear anything to do with it, of course—but we do have people with kids who love clothes and modelling, and they are talented. Besides, in order to model for these garments, the kids need to be able to stand still for a moment. My children can’t possibly do that! It becomes an obsession. I really see the colours of everything. It is quite like cooking actually, the process of thinking through the various combinations and tones. You’ve shops in Brompton, Notting Hill, New York, Tokyo and Kiev. Why Marylebone? I like to be in places that feel like traditional neighbourhoods—and by that, I mean a school, a playground, a butcher, a post office. I can’t imagine being on Bond Street—it’s not representative of what I do or who I am. Marylebone is residential and it’s not far from where I live in Chelsea. I like to feel close to my business. I like it to be part of my life, not an isolated enterprise. Where do you see fashion going in the next 10 years? I think increasingly customers do not want to be paying a lot for fashion—but equally, gone are the days of having cheap manufacturing on our doorstep. This means the margins for brands that are making quality goods are becoming smaller and smaller, making us question whether such brands can even afford to have physical, high street boutiques. Many womenswear labels have gone the way of online-only already, because adding the expense of a retail operation to the price of good materials simply inflates it still further. Now, when people do go out they are looking to spend money on experiences: food, drinks, coffee, theatre. I think online shopping will become more and more dominant. That said, I think a children’s clothes shop is an experience. It’s where you go with the grandmother to buy your girl’s first dress. It’s where as a godparent you go to buy the first gift for your godchild. So, I think people will still make the effort to go to children’s shops—because it’s where you can still make memories.